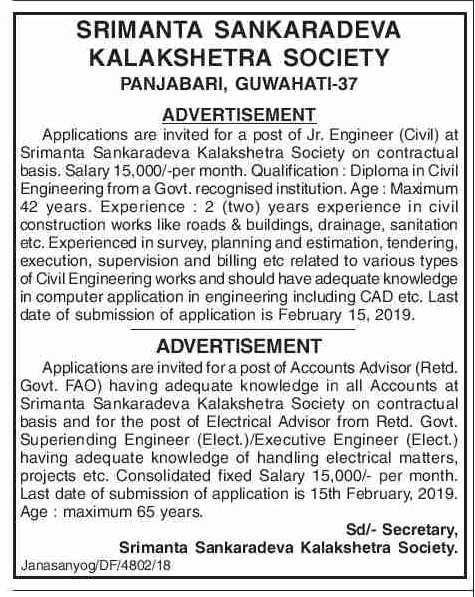 Applications are invited for the following posts at Srimanta Sankaradeva Kalakshetra Society on contractual basis. Educational Qualification & experience: Diploma in Civil Engineering from a Govt. recognised institution. 2 (two) years experience in civil construction works like roads & buildings, drainage, sanitation etc. Experienced in survey, planning and estimation, tendering, execution, supervision and billing etc related to various types of Civil Engineering works and should have adequate knowledge in computer application in engineering including CAD etc. Age : Maximum 42 years. Educational Qualification & experience: Retd. Govt. FAO having adequate knowledge in all Accounts. Age : maximum 65 years. Educational Qualification & experience: Retd. Govt. Superintending Engineer (Elect. )/Executive Engineer (Elect.) having adequate knowledge of handling electrical matters, projects etc. Last date of submission of application is 15th February, 2019.